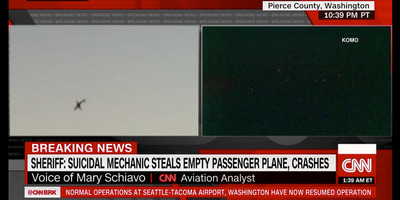 CNNA view of a Q400 airliner and an apparent crash site where the passenger plane went down after a mechanic took off from the Seattle-Tacoma Airport without permission on Friday night. The Horizon Air mechanic who took off in a plane without permission at Seattle-Tacoma (Sea-Tac) Airport was a ground service agent with Horizon Air since 2015, authorities said Saturday. They said the man had undergone various background checks and had full security clearance to be close to the aircraft, but that it was unclear how he was able to operate the plane for about an hour before crashing. The mechanic, who has been described as a 29-year-old “suicidal male,” was killed in the crash. There were no other passengers or crew members on board, and no one on the ground was hurt. Authorities said on Saturday that a Horizon Air mechanic who took off in a plane without permission at Seattle-Tacoma (Sea-Tac) Airport was a ground service agent with Horizon Air since 2015. Since taking that position, authorities said the employee had undergone various background checks and had full security clearance to be close to the aircraft. However, officials said it was unclear how he was able to operate the plane and perform loops in the air for about an hour before crashing near Ketron Island. The mechanic was killed, and there were no other passengers or crew members on board. Ed Troyer, the public information officer for the Pierce County Sheriff, described the person who took the plane as a 29-year-old “suicidal male” who had lived in Pierce County. “This is not a terrorist incident,” he added. Authorities said Saturday the FBI was leading the investigation into the incident, with assistance from the NTSB and FAA. Two F-15 fighter jets were scrambled out of Portland, Oregon, within minutes to track the wayward plane Friday night, Troyer said. The ordeal began around 11 p.m. ET. Alaska Airlines, the parent company of Horizon Air, acknowledged the incident in a statement, saying a Horizon Air Q400 plane was involved. The Q400 turboprop plane is manufactured by Bombardier. It’s designed for shorter-distance flights and can seat 76 passengers, Alaska Air said. The US Coast Guard responded to the crash site where a “large smoke plume” was seen, NBC News reported. 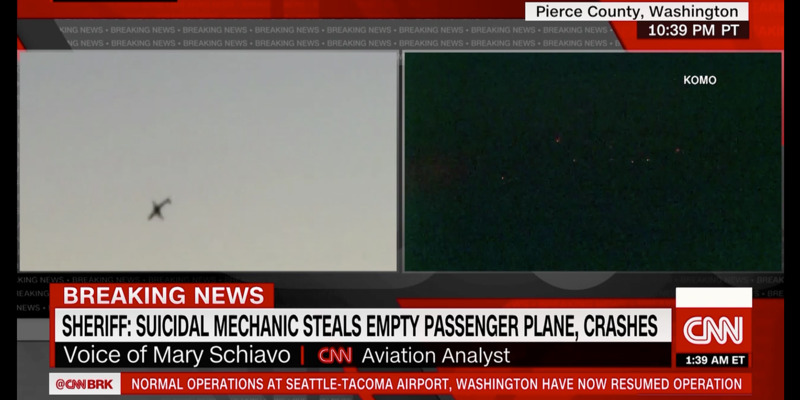 The plane was allegedly “flying around Puget Sound,” before it went down. Rescue boats were on scene. Broadcast images of the crash site showed burning forest land in an apparently dense, dark area near Ketron Island. Sea-Tac Airport returned to normal operations after a brief ground stop Friday night. Dispatch audio of the conversations the mechanic had with air-traffic controllers offered a glimpse into what the man was thinking. The man, who officials on the ground referred to as “Rich” and “Richard.” He told the officials on the ground he had put gas in the plane “to go check out the Olympics … and uh, yeah,” The Seattle Times reported. Additional audio posted on social media featured the man appearing apologetic for what he had done. “I’ve got a lot of people that care about me. It’s going to disappoint them to hear that I did this. I would like to apologise to each and every one of them,” he said. Authorities from Alaskan Airlines said Saturday there are employee assistance programs to address mental health available at all times, but did not further specify. Help is available at Lifeline on 13 11 14 or via BeyondBlue.